All graduating seniors are required to attend a briefing about Commencement and senior check-out. Each senior must complete his check-out process no later than May 8, 2019. 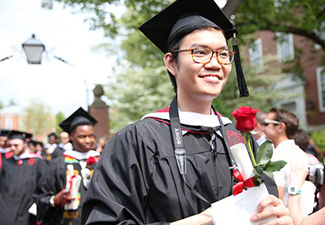 Candidates for the degree who fail to complete all of these requirements in a timely fashion will not be allowed to participate in Commencement, nor will their transcripts be released. Purchase/reserve tickets for the Commencement Buffet, to be held Sunday May 12. Purchase tickets through the Wabash Bookstore. Graduating senior art majors Nicholas Buening, Griffin Hall, Austin Nightingale, and David Thomas will display their work. Graduating seniors and members of the faculty are invited to breakfast with Deans Scott Feller and Mike Raters ’85. The starting time will be strictly observed, and dress for the breakfast is collared shirt and slacks. Join President and Mrs. Hess for a celebration in honor of the Class of 2019 and their families. (Rain location - Detchon Center). 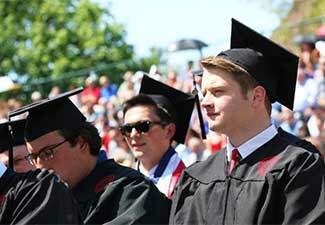 Seniors and Faculty must arrive at 10:30 am for Baccalaureate and 2:00 pm for Commencement. It takes 30 minutes to line up seniors by name. Be on time and quickly find your place. Seniors march in alphabetical order—led by the two Commencement speakers and followed by the men who are receiving academic honors (also in alphabetical order). At the head of the procession is Faculty Marshal James Cherry, who will direct the seating. In the event of rain, the procession will form in Baxter Hall. The Baccalaureate sermon will be given by Rev. Dr. Jessicah Krey Duckworth. A buffet lunch will be served at a cost of $15 per person for graduating seniors and their families. Seniors who are legacies are invited to have their picture taken with family members at no charge. In the event of rain, the procession will form in the lobby of the Allen Athletics Center. In the event of rain, the ceremony will be held in Chadwick Court. Complimentary photographs will be taken of your son as he receives his diploma and will be mailed to parents after Commencement. President and Mrs. Hess will host a reception in honor of the Wabash College Class of 2019. Click here for a complete list of hotels in and around Crawfordsville. Click here for map locations of various events on campus.